Former House Speaker Dennis Hastert’s sentencing hearing in a hush-money case has been postponed. Federal prosecutors asked for the delay because a witness was not available April 8. U.S. District Judge Thomas M. Durkin rescheduled Hastert’s sentencing for April 27. He faces up to six months in prison. 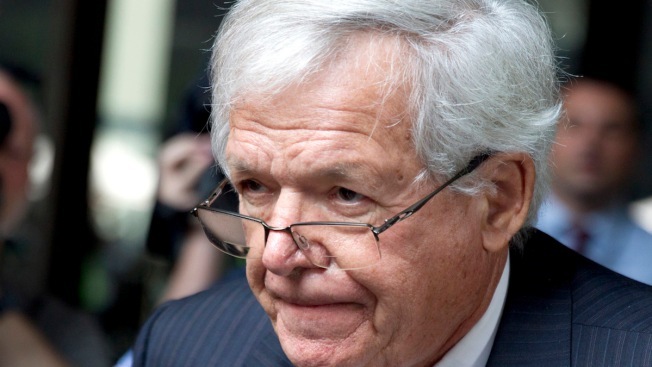 Hastert pleaded guilty last fall to evading federal banking laws. Hastert acknowledged in a statement he began withdrawing cash in $9,000 increments to avoid his banks’ questions about earlier withdrawals of as much as $50,000. And he said he knew it was wrong. “I didn’t want them to know how I intended to spend the money,” Hastert said. In March, Durkin said ordered an independent medical expert to appointed to look into Hastert’s health. Hastert’s lawyer told the judge in January that lab results revealed Hastert had a significant infection on Nov. 3 — less than a week after Hastert pleaded guilty to a financial crime. John Gallo said the man once second in line to the presidency also fell at home that day and “could not get up.” Hastert wound up in the hospital for a spine surgery, treatment for a severe blood infection and stroke. Gallo said Hastert “nearly died” and at one point lost function in the lower half of his body. He was released from the hospital Jan. 15. Hastert’s case revolves around a mysterious “Individual A,” whose identity has yet to be revealed — and who collected $1.7 million from the once-powerful Republican in exchange for silence regarding Hastert’s past misconduct. Hastert had ultimately agreed to pay $3.5 million to “Individual A.” He did so to cover up sexual misconduct with a male student dating to his time as a teacher in Yorkville, sources have told the Chicago Sun-Times. Hastert withdrew $1.7 million in hush money from bank accounts between 2010 and 2014, handing it over to “Individual A.” Hastert had ultimately agreed to pay that person $3.5 million. Hastert illegally structured the withdrawal of $952,000 to evade banks’ reporting requirements for transactions of $10,000 or more. When the FBI asked Hastert about it, he lied and said he kept the cash in a safe place, according to the plea deal.